Here’s another movie with furry aspects for 2014 to add to the addendum to the addendum to the addendum; The Voices, a movie that Wikipedia helpfully describes as a “comedy crime horror thriller film”. It features Ryan Reynolds hearing voices from his pets, notably a dog who acts as his conscience, and a cat who would prefer he just kill people. The movie is a German/American independent production directed by Marjane Satrapi, best known for Best Animated Feature Oscar nominee (but not furry) Persepolis (which lost to Ratatouille), based on Satrapi’s biographical graphic novel of the same name. Besides Reynolds, it stars Gemma Arterton, Anna Kendrick and Jacki Weaver. Reynolds provides the voices for the various talking animals. 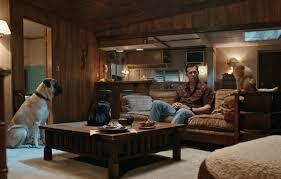 The Voices premiered at the Sundance Film Festival back in January, to mostly positive reviews. However, so far it has not been picked up for a US theatrical release; IMDB lists its theatrical release date as October 3, in Sweden. That one publicity still is suffering from orange-and-teal overload; can you imagine how bad the whole movie is? Mind you, I wouldn't go see a Ryan Reynolds film if it was shot by the greatest cameraman in Hollywood. Nah, this is completely different.